First pitch follows Mithral Dihedral to a ledge. The second (crux) pitch is heads up and mildly run out on tiny cams (have the solid 5.10 leader take that pitch). It involves a traverse, thin gear, bearhugging seams, a roof with a medium to finger sized splitter and xenoliths to a mostly hanging belay. THIRD IS THE MONEY PITCH splitter hands goes to red rocks like golden knobs and a belay stance. Fourth pitch is easy ow to the top of the wall. Follow a ridge with boludery moves here and again to the summit and hike down the sweeeeeet east ridge. 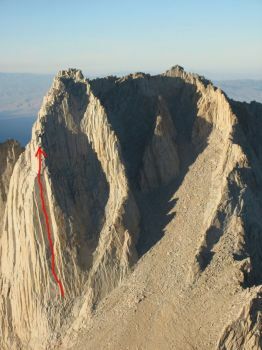 This is the route on the cover of the High Sierra SuperTopo book.